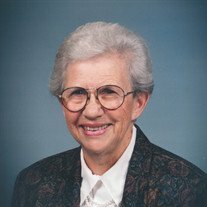 Henrietta Aalsburg Groenenboom died April 2, 2019, at the age of 94 years 51 weeks, at Northern Mahaska Specialty Care in Oskaloosa, Iowa, where she had been a resident since September 2014. Henrietta was born on April 9, 1924, on a farm near Stark’s Station, Mahaska County, Iowa, to Antonie and Minnie MacDaniel Aalsburg. Her family later moved to a farm near Kirkville, Iowa where the family lived for the 12 years Henrietta attended school. She graduated from Kirkville High School in 1941. Henrietta then attended Murphy’s Business School in Oskaloosa. She joined her sister Gretta in Kansas City where they both worked for the Chase Bag Company. She returned to Oskaloosa and worked at Alsop’s Department Store for several years. On February 18, 1948, she married Wilbur Groenenboom at the Eddyville Reformed Church. Henrietta and Wilbur set up housekeeping on a farm one and one-half miles north of Oskaloosa where she resided the rest of her life. Henrietta started her community involvement by serving as secretary of the West Center School Board (a one-room country school, K – 8th Grade) from 1949 until the school closed in 1966. The district was taken in by the Oskaloosa School District. She was active at Lacey United Methodist Church as a Sunday School teacher, Bible School teacher, leadership roles in the Bible School program, United Methodist Women and the church board. She held various leadership roles at the District level of UMW. Henrietta was active in the OskIowa chapter of People-to-People, hosting numerous international visitors in her home and made a few trips with the group to international destinations. 4-H was an important part of her life while her children were growing up. Henrietta helped form 3 different 4-H clubs – the Madison Sunbeams, the West Center Fireballs and the Mahaska Buddies, a club for handicapped youth. She encouraged her children to try new activities and take leadership roles in 4-H. She received the Mahaska County 4-H Leader Award in 1979. Master Farm Homemakers, an international farm women’s organization, recognized her for her community activities and leadership. Henrietta was inducted with the Iowa Class of 1980. She went on to be active in the organization on the State and National level as long as she was able. Henrietta is survived by her children: Joyce (& Ray) Smith of St Louis MO, Phyllis Clark of Brandon IA, and John (& Karla) Groenenboom of Mesa AZ; 7 grandchildren: Jeremy (& April) Smith, Carolyn (& Brian) McPheron, Jason (& Angie) Clark, Adam (& Emily) Clark, Sara (& Nathan) Krum, Katherine (& Robert) Franklin and Jenny (& Nick) White; 13 great-grandchildren; and a host of nieces, nephews and cousins in the United States and the Netherlands; including special cousin, John Aalsburg. She was preceded in death by her husband Wilbur; her son, Jeffrey; her son-in-law, Mike Clark; her parents; and her siblings: Jennie and Anton Knoot, Tunis and Martha Aalsburg, Gretta Aalsburg Lands, and John, who died in infancy. Visitation will be April 7, 2019, from 10:00 AM – 4:00 PM at the Langkamp Funeral Chapel, with the family present from 1:00 til 4:00 to greet friends and relatives. Funeral services will begin April 8, 2019, at 11:00 AM at the Langkamp Funeral Chapel, with the family greeting friends and family from 10:00 AM until service time. Burial will be at Forest Cemetery. Memorials may be directed to Lacey United Methodist Church, 205 Broadway St, New Sharon, IA 50207 or Imagine the Possibilities, 1701 3rd Ave E, Ste 6, Oskaloosa IA 52577. To send flowers or a memorial gift to the family of Henrietta Aalsburg Groenenboom please visit the Langkamp Funeral Chapel Sympathy Store. Posted by Press Release on Apr 3 2019. Filed under Obituaries. You can follow any responses to this entry through the RSS 2.0. Both comments and pings are currently closed.